The new thin clients each offer unique benefits. The single display offers a compact design, with a single DisplayPort video output. The dual 4K display includes a high performance quad core Intel Atom CPU for more demanding applications. The multi 4K display offers a high performance quad core Intel i5 CPU for applications requiring multiple displays. The VersaView 5200 non-display thin client options are ideal for use with VersaView 5100 monitors. This two piece solution separates the monitor and thin client, so either can be replaced independently. VersaView 5200 thin clients are designed to be used exclusively with ThinManager software. 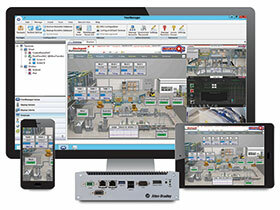 The software centrally manages content and visualisation for every aspect of modern industrial operations. It can help reduce downtime and maintenance by simplifying the management of all devices and users. The location-based Relevance technology from Rockwell Automation can deliver targeted content based on role and location.